Easter is coming up quickly this year. I am trying to come up with non-candy items for the boys' baskets. They're going to get a jelly beans and Reese's eggs, but I want most of it to non-candy. I have a Lego minifigure mystery pack, a book for each of them. They are both playing soccer this year, so I'm thinking maybe some soccer gear? 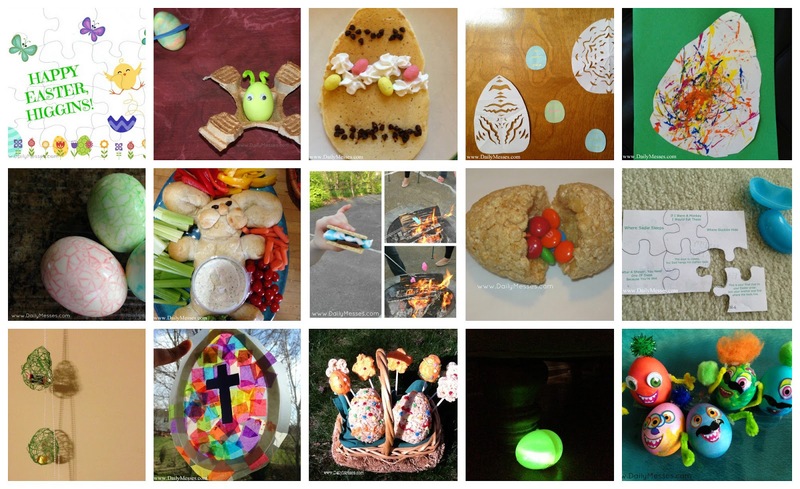 If, like me, you need ideas, I have some of the food/craft/Easter hunt and basket ideas from the past couple of years below. Hidden Surprise Pound Cake: Link is for a St. Patrick's Day themed pound cake, but if you change it for a flower or an egg, it's a great Easter treat! Egg dying and decorating: There are a lot of ways to decorate eggs, however I am only doing ideas that leave the eggs edible. We love eating our eggs! Drip Art Eggs: These look fun and easy to do, but we haven't tried them yet. Stand egg upright and over something that will not get ruined (like a plastic plate). Place a drop of food coloring on the top of the egg. Mist the egg using a spray bottle. Add a drop of another color, mist again. Gently blow on the egg to make colors move in different directions. Monster Eggs: using glue dots, pipe cleaners, and stickers. Tattoo Eggs: Use temporary tattoos. Make sure is completely dry before following tattoo directions. Ombre Eggs: Place a bottle cap on the bottom of a wide 8-10 oz glass. Set egg on bottle cap. Mix up the dye (1 teaspoon vinegar, 40 drops of food coloring, 1/2 cup boiling water). Pour dye into glass until 1/4 of egg is covered. Let sit 5 minutes. Add plain warm water to cup until 1/2 the egg is covered. Let set 3 minutes. Add more water to desired level. Wait 2 minutes. Repeat if want additional stripes. Carefully remove with tongs and let dry. Hunting for Easter Baskets: We do a scavenger hunt to find their hidden baskets. New gear: soccer ball/cleats/shin guards/practice net, baseball cleats/ball/bats/bag/helmet/throw back, shoes: track/running, mouth guards, golf bag/balls/gloves/clubs, etc. Reese's Giant Peanut Butter Egg. Amazon sells some, but I found them cheaper at Target and the grocery store. I believe it was around $6. Lego's: any fun looking set, mystery minifigure packs, Mixel's (Amazon, Lego). Lego usually has holiday themed sets as well; this year is an Easter Egg Hunt Set. They also have a keychain of Batman dressed in a bunny costume! Art/Office Supplies: pencils, pencil sharpeners, markers, stickers, stamps, activity pads, etc. I find a lot of cute items at the Target dollar bins and Party City. DVD's. Half Priced Books, Michael's Crafts, and Target often have cheaper movies. Books, book store gift cards. Clay Pot Baskets. Super easy, cute, and work great as centerpieces. Marble Egg. Lots of fun and looks neat when it's done. After paint dries, cut out an egg shape to have a cool Easter egg! You could even cut out multiple smaller eggs to form a garland, napkin rings, place settings, etc.